Do you remember the Pop Shoppe? I sure do. For those of us who grew up in Canada during the 1970 and early 80, Pop Shoppe pop, in fact, was a major part of our lives. Out of London, Ontario, the Pop Shoppe was more like a ma and pa business that quickly grew and grew and grew. Founded in 1969, by 1972 there were over 500 Pop Shoppe outlets in Ontario alone. Pop Shoppe grew to be as popular as cigarettes back in the day. 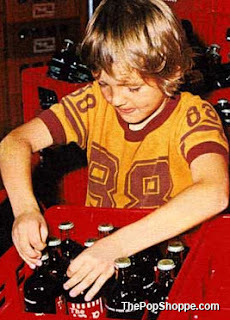 The company always avoided using traditional retail channels, selling its pop instead through franchised outlets and through its own stores, using refillable bottles that came in cartons of 24 for the stubby bottles and 12 for the 1 litre bottles. Now my fondest Pop Shoppe memories were the Pop Shoppe flavours, which numbered nearly 30 in total by the 1980's. I certainly loved the grape soda, the cream soda, the black cherry, the lime rickey, the grape, the orange, the blue raspberry and not to mention pink (whatever that was) as much as the next guy, but my favourite was definitely the root beer. The cool thing was that if didn't want an entire crate of just one flavour, you could pick and chose from the vast variety and take home a rainbow crate of pop. Then, after a week or two of sucking back all that pop, you'd put the empties back into the crate and return those empties to the Pop Shoppe outlet. 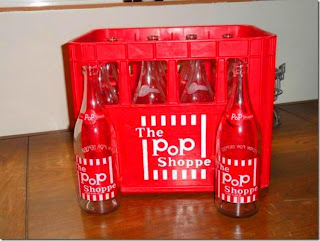 As I remember, no visit to the Pop Shoppe shop was free of the clinking and clanging of returned bottles. So while the 1970's put Pop Shoppe on the pop map, by the early 80's due to competition coming from the big boys of the pop world (yeah you guessed it, Coke and Pepsi, among others, after all they did have the advantage of selling ther products in every single grocery store on the face of the planet), the Pop Shoppe closed the pop shop doors in 1983. Jump forward 11 years to 2004 and the Pop Shoppe is re-established. Basing their marketing and sales strategies on nostalgia, a number of flavours were brought back and a couple of years ago even the stubby bottle was re-instituted. So anyone having a hankering for a cream soda or grape pop can now kill that hankering, but is that magic still there? 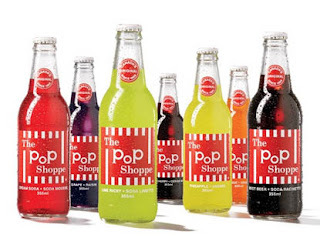 Well one thing that's no longer there is the Pop Shoppe shop itself as the new Pop Shoppe pop is now sold through regular retail grocery stores using conventional retail distribution; long gone are the clinging of return bottles and the rainbow coloured cartons of pop. They say you can never go back. Well fair enough, after all the business went down in 1983 due to the competition. So in the end you can have your nostalgia back but those precious moments (as reflected below) remain in our memories. Is the pop shoppe still around today ? i can only find information till 2009 and i need to know if it is still in business asap. I am sure they delivered to our house. Good old Pop Shoppe! My parents would pick up a case of pop when we headed out to our cabin for the weekend. I loved the cream soda and black cherry flavors.